Manager Barry Smith admits Dundee lack prowess in the final third and still hopes to strengthen his forward line. 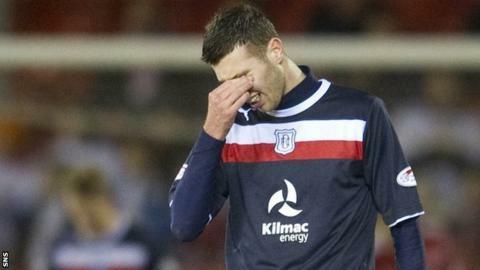 A 1-0 defeat by Aberdeen at Pittodrie left Dundee 15 points adrift at the bottom of the Scottish Premier League. "There's definitely a certain amount of quality and it's just in the final third where we're just missing that wee bit," said Smith. "The performance shows that these boys haven't given in. We can't criticise them because they've worked very hard." A first-half Niall McGinn goal gave the Dons victory but Dundee had their chances with Jim McAlister striking against the bar and also forcing a save from Jamie Langfield. "We thought we dominated the second half," added Smith. "We had chances in the first half. We've done extremely well, especially after last week's result [the 2-0 home defeat by Ross County]. "It's switching off at certain times that has been killing us all season. Again that happens, we switch off for a millisecond and it's a goal. "We've spoken about it in the dressing room, we know where we've gone wrong and it's done with now. "They're willing to keep going and keep working hard and fight to get us out of this position. "We're in the process of [trying to sign free agents] and it's a case of 'the sooner, the better'. We have been looking but it's not easy getting someone that's going to score 10, 15 goals in half a season.